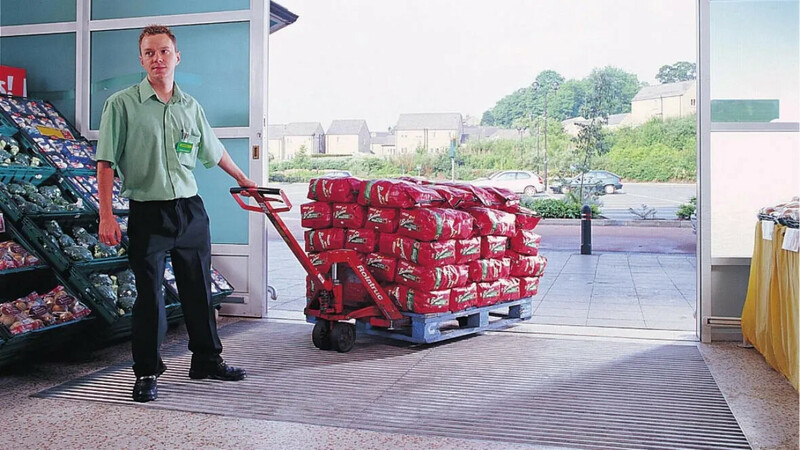 Nuway heavy duty is an ideal matting solution for all internal and external entrance areas where heavy duty loads and intense pedestrian and/or wheeled traffic are to be catered for. 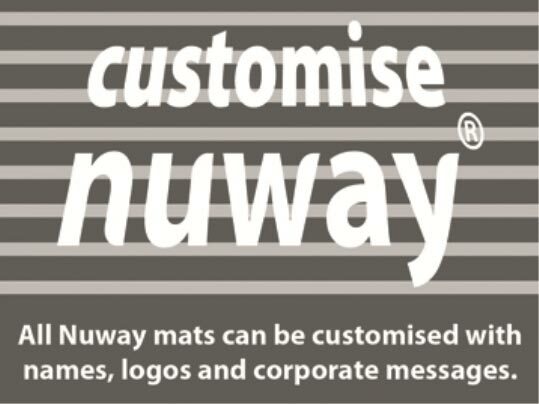 Nuway heavy duty is the strongest type of matting in the Nuway range. 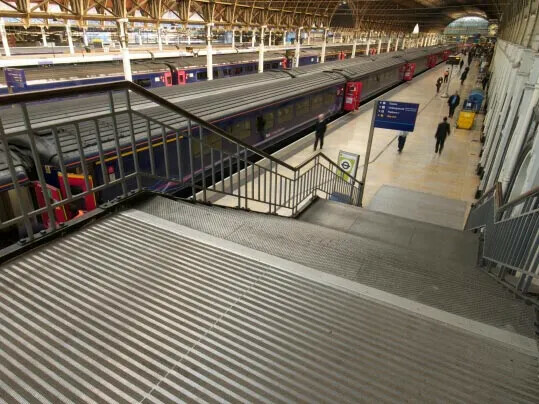 Nuway Tuftiguard HD is the ideal matting solution for all internal and external entrance areas where heavy duty loads and intense pedestrian and/or wheeled traffic need to be catered for. Matting placed outside will defend against soil and the coarsest of foot-borne dirt. Inside it will defend against foot-borne moisture and finer dirt particles. Nuway Tuftiguard HD is double sided which means it can be reversible where the configuration of the entrance mat allows, effectively doubling its lifespan. 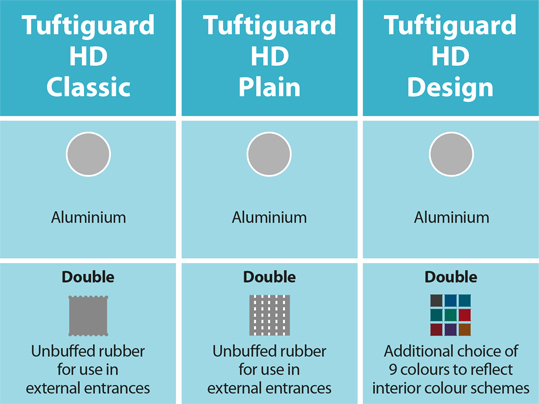 Tuftiguard HD has been designed for maximum performance so the choice of finishes is less than that of standard Tuftiguard. However, there’s still the opportunity to create an entrance which reflects interior colour schemes. Removing moisture from the soles of shoes is vital to prevent people slipping on interior surfaces. Tuftiguard HD has double wiper strips for increased moisture removal. 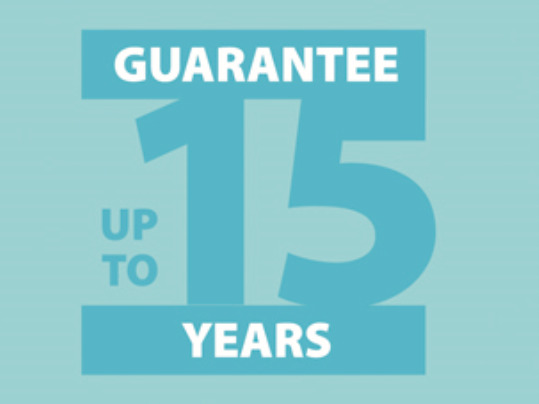 Please contact your local sales person about guarantee policies. 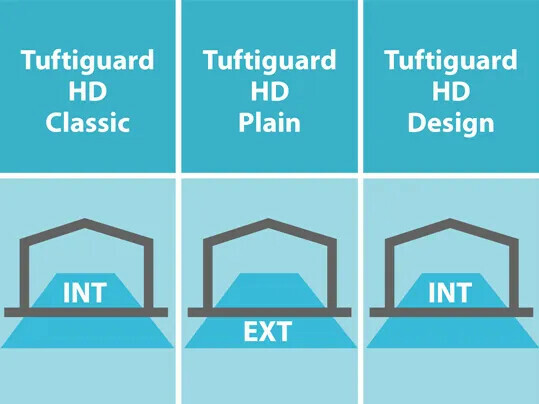 There are three different Nuway Tuftiguard HD collections to choose from, Classic, Plain and Design. Each offers a different level of design and performance flexibility. 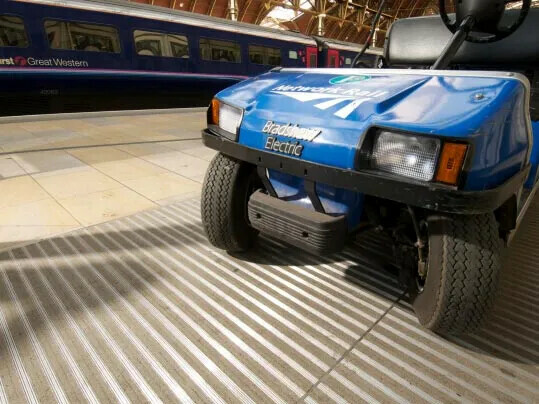 Patented aluminium scraper bars with a special ridged effect to provide an effective scraping surface to remove dirt whilst being smooth enough for wheeled traffic to move easily. The wiper strip is a grey buffed rubber for maximum soil hiding. 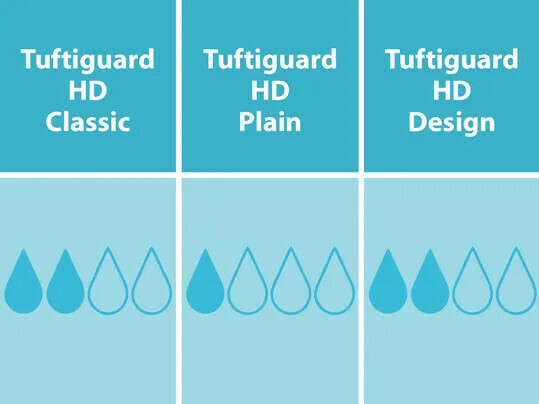 On the Tuftiguard HD range, wiper strips are only available in double format for optimal moisture removal. The wiper strip is unbuffed rubber for maximum soil removal. 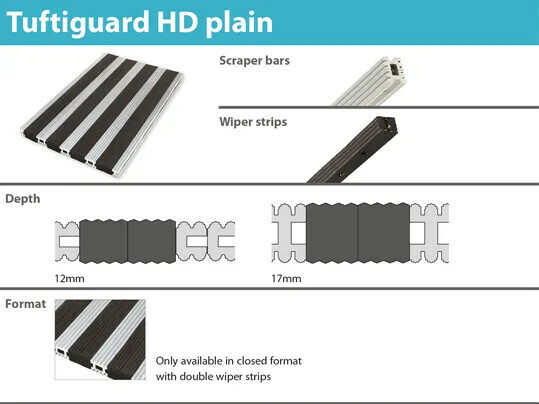 On the Tuftiguard HD range, wiper strips are double format for improved performance. 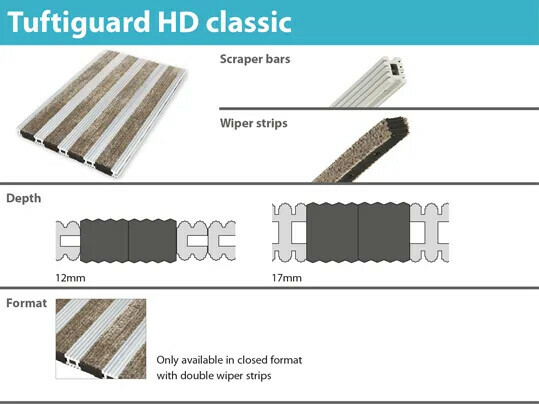 The performance of Tuftiguard HD Classic but with increased design options through the addition of nine coloured wiper strips. There are nine coloured wiper strips available so that the entrance can be designed to reflect interior colour schemes. 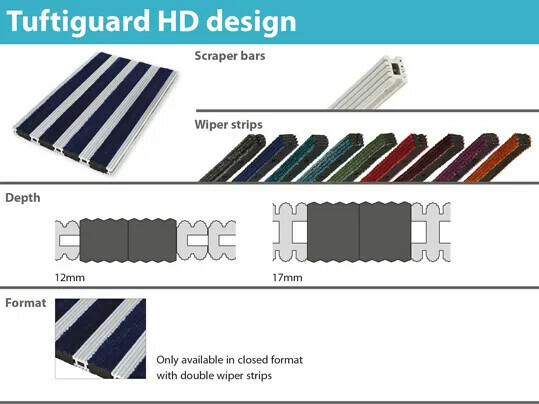 Tuftiguard HD features double wiper strips for increased moisture removal and stronger colour. As with all aluminium matting systems of this type, in very brightly lit entrances, the strong contrast between a light aluminium scraper bar and a dark wiper strip can sometimes create a strobe effect which should be prevented. 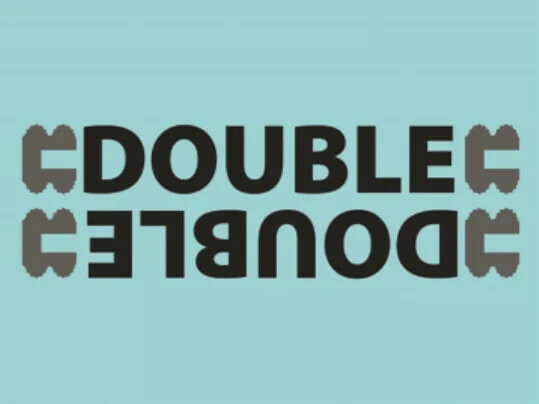 To avoid disorientating pedestrians affected by this type of visual disturbance, consider using a less contrasting wiper strip.